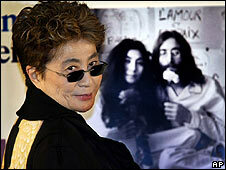 Yoko Ono is suing the makers of a documentary for using John Lennon's song Imagine without permission. The former Beatle's widow and sons Sean and Julian have filed a legal action in Manhattan against the producers of Expelled: No Intelligence Allowed. Ono said the film gave the impression she approved the song's use, leading to accusations that she was "selling out". Premise Media, who made the documentary challenging Darwinian theories of evolution, said it was fair use. The film is at number 10 in this week's North American box office chart, taking $3m (£1.5m) in its first weekend. The legal action claims the way Imagine is listed in the credits suggests Ono sanctioned its use. "Internet bloggers immediately began accusing Mrs Lennon of 'selling out' by licensing the song to defendants," the complaint said. Producers did not ask for permission because they either knew they would not get it or did not want to pay for the rights, it added. Premise Media said they used only "a very small portion of the song". "Based on the fair use doctrine, news commentators and film documentarians regularly use material in the same way we do," a statement said. "Unbiased viewers of the film will see that the Imagine clip was used as part of a social commentary in the exercise of free speech and freedom of inquiry." The legal action is trying to stop Premise Media, C&S Production LP and Rocky Mountain Pictures distributing, selling and promoting the film. Ono, Sean and Julian Lennon and EMI Blackwood Music Inc are also seeking financial damages.